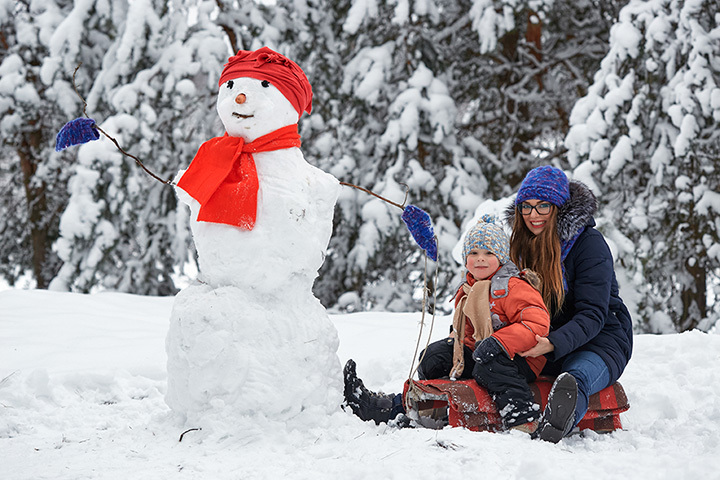 The 16 best family activities for a Snow Day! Do you remember your first snow day? You woke up and looked out to see so much snow you didn't know how you would make it to school. And then the joy when the TV or radio reports (and your Mom) confirmed your diagnosis. It was a day off from school and you weren't even sick! You don't have to be a kid (or live in Buffalo, New York) to experience the fun of a snow day. Many parts of the country still get hit with snow and ice storms so powerful the authorities advise staying home and off the roads. The snow blankets the ground and buries cars. Schools, offices and businesses close and transportation slows or grinds to a halt. You have no choice but to go with the flow and give in to the snow. Here are some places to seek shelter indoors or enjoy snow day activities outdoors. If you can safely get outside, take advantage of the winter wonderland conditions to ski, sled, skate, snowshoe or just slide around. New York has two famous places to skate or watch skaters. One is the Wollman Rink in Central Park and the other is the The Rink At Rockefeller Center, both open seasonally. Out West, the Leon Black Family Ice Rink is open year-round in Beaver Creek, Colorado, but in places like Chicago, they use technology to keep the ice at the McCormick Tribune Ice Rink in tip top shape for skaters. Frosty would have you believe the perfect snowman requires a bit of Christmas magic, but it's more a matter of moisture. When the conditions are right get rolling until you have the perfect three sections to stack together and then bring your snowman to life with charcoal briquets or rocks and a carrot for a nose. Stick twigs in for arms and you can add a scarf or other bits of flair. Enter your snowman in a local contest, like the Algonquin Snowman Photo Contest in Algonquin, Illinois, the Snowman Building Contest in Manchester, Missouri or at the Witter Field Warming House in Wisconsin Rapids, Wisconsin. Snow days are perfect for catching up on all your favorite shows. Pop in a disc, stream from a free TV service or see what your cable provider has to offer. If you can walk to a nearby library, call first to confirm they are open and then browse the stacks for the latest releases or all those other movies you haven't had time to see. This also might be the day to make the matinee. Treat yourself to a big screen movie, but the smallest combo of popcorn, candy and drink. Popular big screen theaters across the country include the Regal Kendall Village Stadium 16 in Miami, Florida, the Studio Movie Grill in Wheaton, Illinois and The TCL Chinese Theatre in Los Angeles. According to Pew Research the average American adult is reading less, so don't be average and read a book. Take yourself and your brood to an open library or bookstore and then settle in for a day among the great poets, writers and philosophers. Most libraries, like The Seattle Public Library give you access to magazines, journals and newspapers from around the world, so take some time to explore what's going on near and abroad. A visit to a museum on a snow day might be the perfect strategy for avoiding lines and crowds. Visit The Metropolitan Museum of Art in New York for its famous ancient and modern art collections or cross over to the other side of town and spend your afternoon at the American Museum of Natural History. Washington, D.C. has as many if not more museums, like the Smithsonian National Air And Space Museum and the National Gallery of Art. The National WWII Museum in New Orleans, Louisiana explains the war from all sides in a special 4-D film while the USS Midway Museum in San Diego, California welcomes visitors aboard the longest-serving Navy aircraft carrier of the 20th century. Big or small, art or history, any time spent in a museum soaking up knowledge is well spent. Even though ice storms are dangerous, the effect they have on nature can be magnificent. The reflection of the sun on fresh snow, icicles hanging from the gutters, people cross-country skiing down the main thoroughfare. Play roving photographer and capture the moment. Ice caves, like the Eben Ice Caves in the Rock River Canyon Wilderness in Michigan and the Decorah Ice Cave State Preserve thrill ice climbers and photographers year round. Decorate the house or decorate yourself. Make a trip to a local thrift store to get some outfits for a costume drama or makeshift performance. Color your hair, paint your nails or press on some temporary tattoos. If you're stuck inside with no one to impress, dress up to impress yourself. If costumes are your thing, The Costume Institute is in the Metropolitan Museum of Art in New York, but you can also find great costume collections at the Costume and Textile Collection of Chicago History Museum and the FIDM Museum And Galleries in Los Angeles. Are snowflakes really all unique? What makes it snow anyway? Get yourself to the science museum and reason it all out. Science museums are the perfect place for curious minds and active bodies to get their hands on interactive experiences and experiments and tire themselves out! COSI is a top-rated science museum and research center located in Columbus, Ohio. COSI stands for Columbus Ohio Dynamic Center of Science and Industry and its mission is to "inspire the scientists, dreamers and innovators of tomorrow." Of course, you don't have to go to a science center to do science experiments. Just don't blow up the house. Volunteer some of your time to a good cause. Even if it's just down the block to shovel out a neighbor. It feels good to do something nice for someone. Pick up the phone to call a sick friend, write a letter or go to the store for someone who can't or shouldn't venture out. Now might be a good time to go through your closets to gather up coats for the coat drive or pull some cans out of the pantry for the can drive. Call your local food pantry, soup kitchen or Salvation Army to see if they could use a helping hand or sign up at a site like VolunteerMatch to find a way to pay it forward. If your employer supports volunteerism, investigate the options or suggest an easy way your company can get involved in a community effort. Chances are you have more than a few tricks up your sleeve, including some games on a shelf somewhere or at least a deck of cards. You don't need anything fancy to Head's Up, but maybe you're tired of Pop Culture or 80s Movies. Head to the mall or game arcade to drive go karts, shoot real or virtual hoops or find an original Donkey Kong. Ground Kontrol Classic Arcade in Portland, Oregon is a class arcade where you will find free play days with your favorite arcade games along with special events like "Geeks Who Drink," a pub trivia quiz. On the East Coast, they warm things up at Barcade in Williamsburg, Brooklyn with craft brews and maintain machines for die hard fans of Asteroids, Mr. Pac Man and Tetris. Home alone with nothing but time on your hands? Tap into your creative side. Paint a canvas, pot a plant or fix up something for feeding the birds. Find a ceramic studio like the The Ceramic Studio, Etcâ€¦ in Howell, Michigan where you can drop in when the spirit moves you or call ahead to plan a fundraiser or group activity. Build-A-Bear at a workshop with the little ones or make a date to Paint & Sip with your drinking age friends. If it's your first time on skis take a lesson with a pro who can show you the basics and make your day on the slopes go more smoothly. Wachusett Mountain Ski Area in Princeton, Massachusetts is a good place for beginners with a "feeder hill" and an area for first timers set apart from the daredevils. Sugarbush Resort in Warren, Vermont has ski-school programs for all ages and levels and families give Purgatory Mountain in Durango, two thumbs up for ski and snowboard schools. You might not be able to walk into Julliard on a snow day to fiddle around on a famous instrument, but don't let that stop you from finding a music school that will welcome your unique talent. The Music Class is like a Gymboree for the musically-inclined. They offer early childhood music and movement classes "designed to unleash the musical potential of young children." Kindermusik and Music Together are two other chains that connect "families and communities" with the universal language of music. Now that you've cleaned out your closets you can see all the room you have for some new things. Shop online or shop in the store. Chances are you will have the dressing room to yourself, so take your time trying things on and don't feel pressured to buy. A snow day can be a good day for retail therapy and a way to support local businesses. One of the 10 best malls is the Mall of America in Minnesota with more than 500 stores and famous for a Lego emporium and indoor amusement part. In Houston, Texas they do their high-end shopping in The Galleria with stores like Tiffany and Gucci. Slap on the snowshoes or cross-country skis and head off into the great outdoors for a walk or a hike. Visit a local park with your sled or find a ice fishing shack to hole up in. A snow day is a day for being out in the snow, so bundle up and brave the elements. Some of the best places to find intrepid ice fishermen (and their buddies) are on Lake Michigan and Higgins Lake in Michigan, Mille Lacs Lake in Minnesota and Lake Champlain in Vermont.